Greenleaf & Lankford Foresters offer Opportunities for . . . 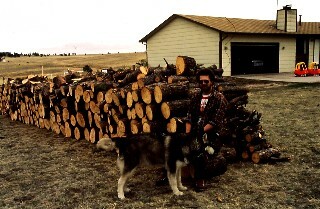 Welcome to our Firewood-to-Cut program in front-range Colorado. Greenleaf and Lankford Foresters, Inc. are your best connections to a personal source of forest products and uses near you. Let us serve you with access to choice private land and enjoyable outdoor activities for productive fun, learning and profit. Give us a call at 719-783-4250. We will tailor a cutting oppo rtunity for you. To get the lowest prices, start early, shop our listings carefully, combine products and purchase larger volumes. Groups welcome! You may use the wood personally or for business. 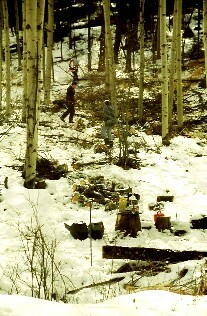 Firewood cutting areas: All sales get their own designated site or marked trees; no one else will be cutting there. You are shown a choice of exclusive sites within each location so the sale can best meet your needs. Forester-scaled (forester determines quantities): Standing trees selectively marked for forest improvement thinning and measured. You may get volume overrun. 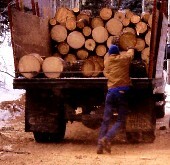 Buyer-scaled (buyer measures quantities): Trees are marked or designated and the cut wood measured on loaded trucks, recorded and reported to the forester. Dead wood: Seasoned mixed-size wood that is lighter to load and haul and in many cases already cut down. 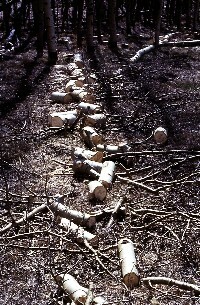 Some wood is left after sawtimber logging or blown down. Insect-killed wood is usually treated on site before removal so there is no danger. May have some mixed green wood. Green wood: Concentration of marked trees in new cutting areas, allowing most efficient cutting with best choice of access and tree sizes. Seasoned wood: Pre-cut wood seasoned for several months either in the woods or in stockpiles. Our premium wood. Special sales: Involve rebates or trades for special harvesting work and slash hauling. Ask for details. Add to your sale or start a new one in the same location. We will reserve your area when possible from year to year so you can continue to have the cutting area you want. A sales contract defines job specifications as to orderly progression, low stumps and slash treatment. Most sales have security deposits and possible extension fees to guarantee job quality, timely completion, and security of restricted cutting areas. Normal deposits equal $50-$150, or $5/cord, and are refundable upon meeting specifications. Note: Quantities are limited & prices are subject to change. Initial sales may be limited to 5-25 cords. A STUDY BY THE COLORADO STATE FOREST SERVICE REVEALED THAT GREEN PONDEROSA PINE, CUT, SPLIT AND STACKED CAN DRY TO A 15% MOISTURE CONTENT IN JUST 35 DAYS. THE OPTIMUM FIREWOOD MOISTURE CONTENT IS 15-20%. FOR ALL WOODS, BEST BURNING WITH LEAST CREOSOTE BUILDUP IS SMALL, HOT FIRES.